It’s not often that the Voices.Earth blog gets the opportunity to interview an iconic figure who is promoting the environment and the new top level domain (TLD) movement. 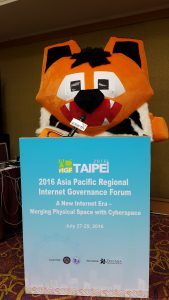 Recently we had the opportunity to speak with Ajitora, the Asian Tiger from Cyberspace, who is stakeholder engagement manager of DotAsia, as well as the official ambassador the Tx2 (#doubletigers) campaign. 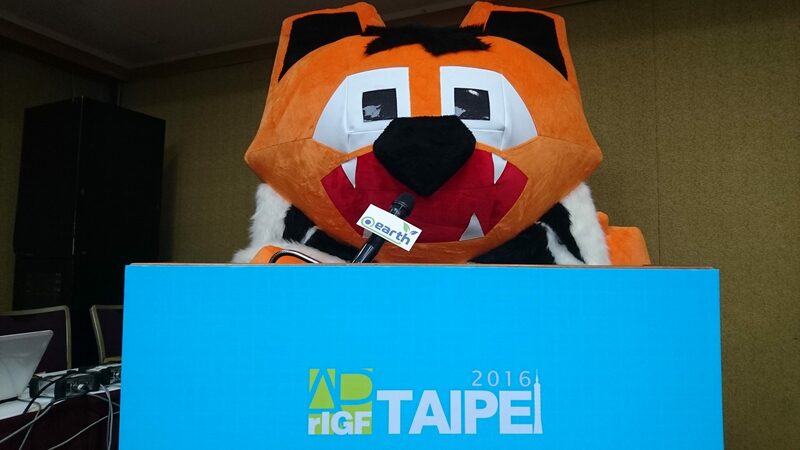 Below is the full interview, which took place at the 2016 APrIGF Taipei conference, for your reading pleasure. Q: Ajitora, tell us a little bit about yourself. A: RRAO!~ So everyone is all about Pokemon Go now, and those little digital sprites are cute, they make me proud to be the original cyber tiger, a digital native, born from the Internet when the Wi-Fi was connected in the Himalayas! Q: Tell us about the TX2 campaign. A: Tx2 is a goal – to double the number of wild tigers by the next Year of the Tiger, 2022. The 13 tiger-range countries have pledged their support. Since my appointment as a Tx2 Ambassador, the number of wild tigers has grown for the first time in 100 years — from as little as 3,200 to 3,890 tigers! With everyone’s help we can beat this goal! Let’s ROAR forward together for our mother earth! Q: What is your role in this campaign? A: I am a Tx2 Ambassador! While my fellow ambassador Leonardo Di Caprio was busy celebrating his Oscar win earlier in the year, I was working hard at the 3rd Asia Ministerial Conference on Tiger Conservation in Delhi! I am the poster tiger to bring this message to everyone – that we are facing a turning point in our efforts with wild tigers, and the Internet actually has a really large impact on wildlife and the earth’s environment – from online black market selling illegal animal parts, to poachers using unsuspecting tourist geotags of photos of wild tigers. But, it’s not all bad news because the Internet also has a big role to play to help rangers with their work in the field to improve communications, getting policies around taking down illegal market websites, and getting everyone aware of what they can do to help spread the message. Q: Tell us about your role with .Asia. A: I’m the stakeholder-engagement manager at DotAsia! What does this actually mean in plain human-speak? My job is to tell the world about the community work we do at DotAsia, and also to invite the world to join in our vision of collaboration for progress and sustainability in Asia. Q: Tell us about what “TLD” means to you. A: A future friendly for tigers! Tigers share this earth with humanity and the sustainable development goals (SDGs) spell out a common future that allows us to roar forward together! I look forward to traveling with my DotAsia team to Internet industry events to spread the word about the symbiotic relationship of the Internet, wildlife and the SDGs. I love to zip across the globe through new domain names And, I would love to meet my wild cousins in their natural habitat, and meet more friends and cyber tigers too! If you want to follow my adventures, check out this link. We would like to thank Ajitora for speaking with us! To learn more about the Tx2 campaign, please click here, and click here to learn more about DotAsia. Stay tuned for more coverage of the Tx2 campaign on the Voices.Earth blog!